J: Mommy, look at that hand statue! Me: I know, buddy. Isn't that silly to have in a front yard? J: It's not silly, Mommy. It won't grab you. Me: You don't think it's silly? Do you like it? J: No, it's too handy. J: They just said a bad word! J: The milk is sour. I cried more this weekend than I have in a long time. My dad calls this emoting. I think it's a funny word so I'm using it to balance the melancholy that is about to come forth. My dad seems like your typical Texas outdoorsman. You might even call someone like him a redneck. His neck is, in fact, at all times red. But he has a very tender heart and he is one of my favorite people to talk when I'm in the state of emoting. He would have been a great therapist. But he is not here right now and the blog is, so here we go. A) I watched a program called Hurricane Katrina: The First Five Days. It was absolutely horrifying to see what those people stranded in the convention center and Superdome endured for five days. They had no food, water, sanitation, information, or deliverance. It is incomprehensible that that kind of suffering and indignity could happen here in America. Not to mention the enormous loss of life in the Ninth Ward and elsewhere. B) My childhood best friend, Molly, would have turned 30 years old last week. I'm friends with her sister on FB and she was posting old pictures in honor of that day. I completely lost it. Her mom and sister had a little birthday dinner in her honor this weekend. I wasn't there, but I spent some time thinking about this dear friend that I have missed so much. I hate death. C) On Saturday night I got to visit an old friend from high school, D.D. He was a good friend of mine and a really godly guy. We were voted "most down to earth" of our senior class and have a picture together in the yearbook. Anyway, about two weeks after college started D.D. was in a terrible car accident that left him with a brain injury. My friend lost his short term memory, which is one of the most precious things we have. He remembers everything before the accident but very little after. He keeps all the details of his life and each day written down in a planner so that he can refer back to it. By the time he went to bed that night he probably didn't remember that we had seen each other. Definitely not by morning. It is so terribly heartbreaking. I will admit to you that I could have been a much better friend to him through the years. It's so painful to see his suffering. I know how selfish that is and I need to get over it. To be honest with you, I don't like the feelings I have toward God when see my friend. Why, God, would you let this happen to someone who was so faithful to you? I have to think of the eternal reward D.D. will experience one day. Do you know what brings me to my knees? The way D.D. comes to life when he talks about Christ. The way his eyes light up and his voice gets louder. He may have been slowed down or stopped in every other area of life, but when it comes to his passion for Christ, he is strong. He has joy. The time I spent visiting with D.D. and his mom stayed with me through the night. When I would turn over in my bed, those conversations were still playing in my mind. The next morning I cried through my quiet time as I both wrestled with God over this and thanked Him for His faithfulness. D) I had a bit of a meltdown this morning over our Compassion trip. The anxiety was building in my chest and I felt like I couldn't breathe. It wasn't about leaving or missing my kids. It wasn't about being in another country. It wasn't about what I'm going to pack or what I'm going to see or who I'm going to meet. It wasn't about what I'm going to say or who is going to sponsor a child. I have peace about these things. I was drowning in anxiety because I am leaving the three people dearest to me and I cannot control how safe they are while I'm gone. I know, I know. Whatever you are saying to me right now, I already know it. I'm just telling you what I know to be the true root of my anxiety. My greatest fear is that my whole family will be taken from me. I have been known to go to great lengths to prevent them from being in a vehicle without me. Of course, that can't always be avoided. When it happens, I always have to fight that wave that wants to crush me. This is the truth I have to speak to my heart: if something happens to my family and they all die, leaving me here alone, I have to know that it was God's will for them. It would not have been because I didn't do a good enough job worrying or trying to control their destiny. 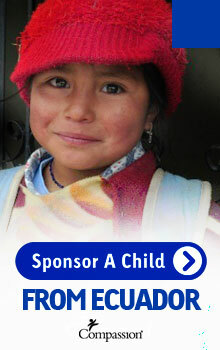 I am truly helpless to keep them safe, whether I am here or in Guatemala. And I have to surrender this to God. It's just not enough to say, "Oh Lord, I know you won't let ____ happen." Look those people in New Orleans. Look at Molly. Look at D.D. Suffering surrounds us in some form at all times. I will be looking extreme poverty square in the face next week. As my mom says in So Long Insecurity, I have to think about how God would be faithful to me through the disaster. 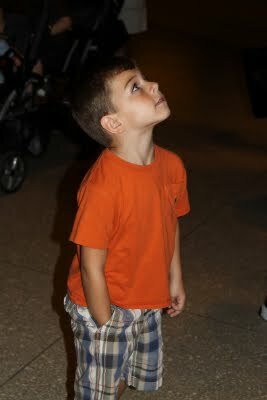 I have to take the thought full circle - beyond the imagined catastrophe and into the grace that He would provide. This is when I can recall the joy and hope of Christ that I see in my dear D.D., who has been through so much, and know that God's love and faithfulness are real. Today was so great that the only thing that would have made it better would have been the Lord's glorious return. I am surely longing for that. 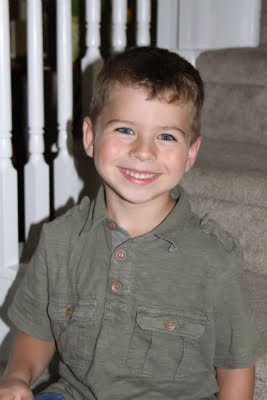 Jackson had his first day of his last year of preschool. Did you follow that? Eek! That means the next time I take him to a new class it will be for kindergarten. That is craziness, I tell you! 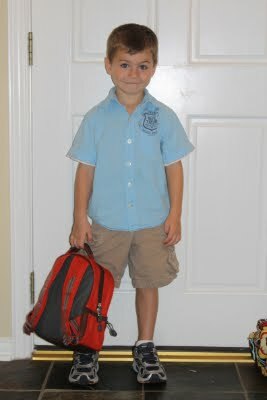 Pre-K is less about me getting a little break and more about him learning and becoming prepared for the school years. He loves going and I am excited to see how he will grow this year. 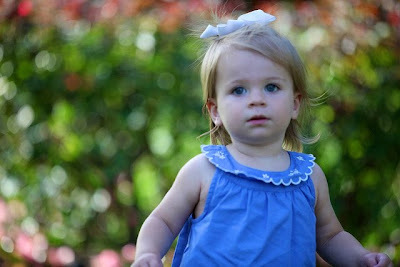 Annabeth got to go to mother's day out for the first time today. It was February when I registered her for this fall and she seemed too small and sweet to go. 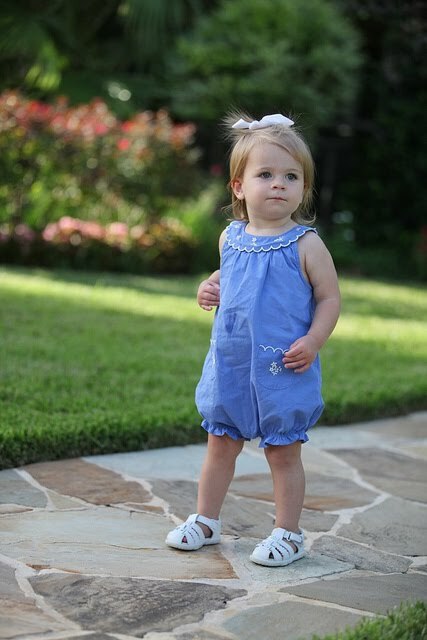 I couldn't imagine being ready to drop her off for 5 hours, twice a week. But I remembered Jackson at this age and thought I would probably regret not signing her up. And, wow, if you have an 18-month-old you can probably relate to my current feelings of readiness! I didn't get too worked up about the whole thing. There were no tears. I'm saving those for next year. The most emotion I felt was the (minor) regret of Annabeth's brown, red, and yellow nap mat and blue, pink, and green backpack clashing. Also, my mom tried to shame me for using a paper lunch sack instead of a real lunch kit but, hello, it doesn't have to be cleaned out and it weighs less! The amount of stuff I will be hauling to and from the car while carrying one child and holding the other's hand is truly amazing. The paper sack is a survival technique and I HAVE NO SHAME! 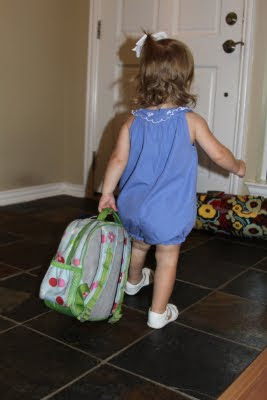 I attempted to take some adorable pictures of the kids before leaving. Annabeth must have understood where she was about to go because when I got the camera out, she began clinging to my leg and whining. All I could do was take some of Jackson and hope she would get jealous of the attention and join him. I gave her her backpack and she ended up dragging it over to the door, sitting down on her bedroll, putting her arm on Jackson and smiling for the camera. I could not believe it. Of course, I missed the half-second that they remained in that pose. Drop off was pretty painless. I was wishing I looked cuter, but a major benefit of all this is to be able to beautify oneself in peace. So I dressed in clothes that at least made it look like I'd worked out or was going to work out. Doesn't that excuse the morning uglies? I think so. I showered in complete privacy for once and got ready to take my sister to lunch. I was running late and assumed Melissa was too, so I went to my parents' house without my makeup on. I would just do it there in the company of my two favorite women. Mom was about to get picked up to go to the airport, but we would have a few minutes together. I was fishing around in Melissa's makeup bag for something and that turned into her doing my makeup. We've tried this before and I've always felt like Elvira, but today I liked it. I did, however, get rebuked for not wearing earrings after all the work she'd done on my face. Horror of horrors! She fetched me some of her own and there was reconciliation. Melissa wanted to go to Ruggles Green at the City Center (AKA the trendy graveyard of Town and Country Mall). I was a little apprehensive, given that I typically scoff at hippie food because it's bizarre, small, and doesn't taste good. But we went for it and I have to say that I've never had a better grilled chicken sandwich in my life. We even got some pink velvet cake to go. It was pink because they don't use all the dyes to make it truly red. Or something eco-friendly and organic like that. I don't know. I'm just a Texan who was raised by a father who doesn't trust vegetarians. And whose greatest fear is that I won't allow my son to hunt deer when he's old enough. Don't tell my dad that Melissa ordered a veggie burger. After lunch we walked across the street to Anthropologie. All the beautiful fall clothes were out and we were both drooling. At this point we were really missing our mom. Our husbands are very lucky that we had to pick up the kids because we did not have time to do much damage. We trekked back to the kids' school and I was grateful to have Aunt Melissa there to help me get everyone and everything to the car. It's a law of nature that some sort of shenanigan has to happen at the start of school and lucky for me, my sister got to witness it! 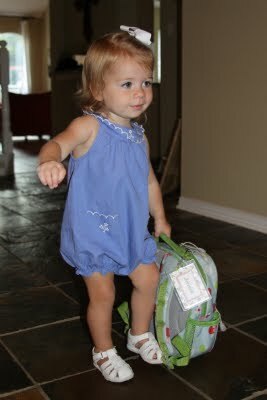 We went to Annabeth's class and I quickly found out that I had not packed enough food in her lunch. Yes, just take that in for a moment. They had to give her goldfish borrowed from the snack reserves. Her lunch had a turkey and cheese sandwich, a baggie of quartered grapes and some milk. I started to put a cheese stick in there or some Wheat Thins, but I thought surely she would not eat all that! I was wrong. So very wrong. Melissa and I couldn't stop giggling about my humiliation all the way to the car. Next time I will do better, Annabeth! Despite having a mother who needs food service tutoring, I was told that Abey did great today. Jackson seemed to have a great day, too. Both of his teachers seem wonderful, as do Annabeth's! We made a beeline for the Dairy Queen and got Jackson a little Blizzard. Then we headed to my parents' house just to hang out. I made some tea, Melissa made some coffee, and we dug into our pink velvet cake. Lis spoke Jackson's love language of playing hide and seek. We could have stayed all day but the kids were exhausted. Jackson fell asleep two minutes after we got in the car. I never know whether my sister being around my kids is going to help or hinder my chances of having nieces and nephews on my side of the family. She sees everything from the chaos and the frustrations to the absurdities (her favorite) and the awesome moments. Like when Annabeth pointed at my bridal portrait today and said "Mommy!" Thank God I'm recognizable, right? Ha! Whether or not I ever get to be an auntie to some sweet little Fitzpatrick babies, my kids have a fantastic aunt in Melissa. They have only begun to realize how fun she is. We love you, Lissy! Thanks for such a great day! Aber hauling her little backpack to the front door to join him. Independence is her love language. This lovely picture is the closest I got to that dreamy moment of sibling affection. See AB's arm outstretched? And doesn't Jackson's expression sum up the family photography experience? My brain is too full of stuff to write without bullet points! And exclamation marks! -We took the kids to meet their Pre-K and Mother's Day Out teachers today. God bless them! I feel really good about these sweet and capable ladies who will be caring for my beloveds. -My sister and brother-in-law are in town. I am praying hard for God to move them home soon. Please, sweet Jesus! -We were in Colorado! I spent our lazy mountain evenings reading Dr. Wess Stafford's book, Too Small to Ignore. I'm not finished, but it has been great preparation for the trip. So, a very generous and wonderful family allowed us to stay in their condo in Vail last week. What? A free vacation in Colorado? How quickly can we leave?!?! The answer was 36 hours. It was a two-day drive but it was totally worth it. It was simply amazing to be able to play outside with the kids. The heat index here today is 110. When we left Vail yesterday morning it was 48 degrees. Is that not glorious? -August in Houston is so hellacious that I do not understand why there is not a city-wide revival every year. -Guess who is doing some post-vacation WW points tracking? Oh yes, that would be me. Pass the baby carrots. And the ibuprofen. I've got a mean headache from the return to sea level. Let's call it reverse altitude sickness. Annabeth was given her first Cabbage Patch doll. She's holding "Myrtie Tonia" (really?) below. She was a big hit. 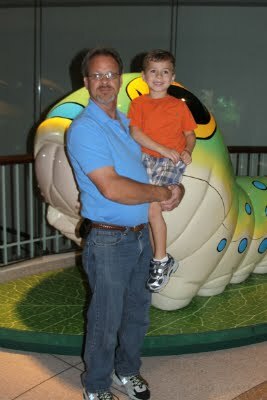 First we visited the butterfly center. I told Jackson I wanted to take a picture in front of this thing so it would look like it was about to eat him. He was not amused! You have to admit that this is hilarious. The most interesting and freakish part of the whole day was seeing all the bugs and spiders. This is a black widow. Here's a tarantula. Above it was a sign that said, "Tarantulas make great pets!" 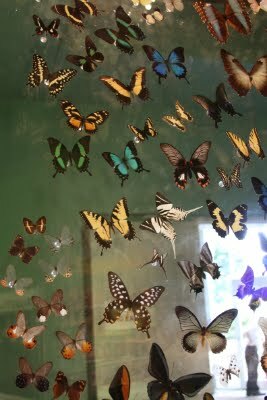 But it was all about the butterflies, baby. 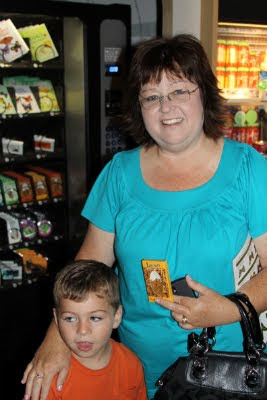 Here's my mother-in-law purchasing a snack pack of bugs to take home to my nephew, Gavin. Jackson was still not amused. I was excited to see Jackson's face when he walked in the big room with all the dinosaur bones. He couldn't get over how big these creatures were. Wrong! Annabeth is at the peak of restaurant mischief. Cozy and Steve, aka Nana and Pappaw. There was lots of game playing all weekend, including Chutes and Ladders, Old Maid and Go Fish. Curtis preached all three services at our church on Sunday. Afterward we had brunch at the Memorial City area Pappasito's and it was splendiferous. (Thanks, NancyMon!) My parents joined us and mom and I shared breakfast tacos and pecan pancakes. Houstonians, there's a reason why so many people are talking about this - it's great! Steve and Cozy were flying out of Hobby Airport late this afternoon, so we decided to make a quick trip to Galveston since we would be so close to it. I'm not sure how, in all these years, we have never taken them there. We basically drove down the seawall to show them the ocean and then went straight to LaKing's, which has been my happy place this summer. Praise the Lord for pecan turtles. Jackson found it impossible to close his mouth while eating saltwater taffy. Then we tortured ourselves and walked down to the Elissa. Jackson and Curtis went on the boat while we stood in the shade and tried not to have a heat stroke. I gave Hubs the camera and this is the one picture he took. Y'all, I have really tried not to go on and on about the heat but this is the time when Houstonians cannot have a conversation without mentioning it. I think it's fair to describe the state of our city as sluggish, downcast, wilting, and grumpy. It has been miserable. This morning I got dressed for my run, then looked out the window and saw that it was sprinkling. Glory be! The Lord had heard our cries! A few minutes later it was gone. It had been a very short deliverance. I went on my run and came home looking like I'd fallen in the bayou wrestling with a nutria. My face was red for an hour. A little while after we got home from our mini-road trip, I heard thunder! I looked out the window with great anticipation and saw huge dark clouds approaching. I've never been so happy to see a thunderstorm coming. Rain came down like one of those awesome showers at the Westin. The earth was dirty and sweaty (so were we) and we needed it! It's still raining and I can describe the last few hours as nothing less than glorious. If it weren't lightning, I would go out in the street and dance in it. Or maybe in my backyard. We were sad to see Steve and Cozy go. It was a wonderful visit. I'm really thankful my kids have two sets of grandparents who love them so much. Watching Steve with my kids, I can see what a great dad he was to Curt and Lindsay when they were young. It explains a lot about why Jackson and Annabeth have such a hands-on daddy. Call me thankful! Cozy, you are an amazing mother-in-law and I love you so much. Thank you for taking your vacation days to come see us in plain ole, boring, sweltering Houston. We love you. Our family is in a period of reorganizing. We've had a busy summer and our big commitments have come to a close. Summer day camp is over and it will be a few weeks before my kids start "school." Jackson will be in pre-k and Annabeth will start mother's day out for the first time. I don't really remember what it's like to be alone in my house and I am very excited to get in touch with that feeling again. Since we're in this reorganization phase, I decided it would be beneficial to get reacquainted with my kitchen. Actually, if you want to get down to the nitty gritty, I was begging and pleading with my husband for something and my end of the deal was that I'd cook more. So there you have it. It's gone pretty well until today! I made cheesy enchiladas on Monday night and still managed to get to my aerobics class at 5:45. I probably smelled like a sweaty onion, but I felt like every woman. As a bonus, I was so flushed from the hot kitchen that my skin looked youthful and dewy. Score! Early yesterday morning I went to HEB to restock our fridge and pantry. And I think we were down to one diaper, which is not a good feeling. I tried to get everything I needed to make our favorite chicken cheddar rice bake. I haven't made it since before my weight loss extravaganza and it just sounds good. However, I was there so darn early that there were no rotisserie chickens. What!?!? Come on, HEB! Doesn't the early bird get the bird? I thought it would be fun to deviate from our normal toast-for-breakfast routine, so I bought canned biscuits and some reduced fat breakfast sausage. Oh, help me Jesus. Y'all know I have major issues with raw meat. Beef is relatively easy for me because I can just remind myself that Curtis eats his steaks medium rare and lives to tell about it. But poultry and pork send me over the edge. And never once have I cooked seafood (beyond fish sticks) in my kitchen. So the sausage. I pumped myself up to be a big girl about it. I put the biscuits in the oven and boldly turned toward the roll of raw meat. I followed the directions perfectly. Yet when I turned the patties over they were totally blackened. Awesome. I sent a picture to my mom and said "Nanny lives on." My grandmother was famous for serving up sausage patties that looked like coal. By then the biscuits were ready to come out and they were well done, to say the least. Four minutes later - just as the directions said - my sausage patties were ready! The other sides didn't get as black and I thought that was a good thing. I obsessively cut into several patties to check for any pink and I thought we were all good. Then I started eating. And I couldn't fight the feeling that the meat was pink! Several patties went in the trash. I started getting a stomach ache just anticipating the impending food poisoning. Isn't it fun to be me? Before my obsessive compulsive meltdown, Curtis, who should have been packing my bags to take me to a special home, wrapped a sausage biscuit in some foil to take with him to work. Then he realized he didn't have his wallet. (He'd left it at my mom's and she was bringing it to him later.) A look of sheer disappointment and devastation came across his face. He was totally playing me! He was taking the food as a front but still planning on going to McD's for cinnamon melts! Caught in the act! In the end, how can I blame him? I overcooked the biscuits, over and undercooked the sausage, and even managed to steep my tea for twice as long as I should have. I think the moral of this story is STEP AWAY FROM THE KITCHEN, AMANDA JONES. Here's a look at your life at four-and-a-half years old. -When I come home from the grocery store with all kinds of new things to eat. This is your love language. -Your "soft blanket," which now has two large holes in it. I fear it is not long for this world. -Going to bed at night. You often come out and say "Mommy, I need to tell you something." Then you have to think about what it is you need to tell me. -Being called a "turkey" or a "little boy"
-Saying goodbye to last year's teachers. You have talked about them all summer and you don't understand why you won't be in their class next year. Joyful, happy, sunshiny, busy, curious, funny, handsome, enthusiastic, eager, imaginative, fun, protective of your sister, loving, growing in faith and knowledge of God, smart, strong, and fast. Jackson, this summer has been really important for the two of us. Mommy had been in a season of feeling stressed out and frustrated. I was not giving you my best and it made my heart so sad. God saw what I needed - and what our family needed - and moved a mountain so that I could be the kind of mommy you need me to be. And the kind of mommy God made me to be. When I look at how much closer you and I have become this summer, it makes me want to cry. I wish I could go back in time and make this happen sooner, but I can't. Instead, I am turning those feelings into thankfulness for the present and into joyfulness for our future. My son, you are fearfully and wonderfully made. God handcrafted every little piece of you to His glory and good pleasure. You are like a young plant thriving in the sunlight of your God. I pray you keep growing toward Him wherever He moves. My Littlest Love is under the weather, so it is girls day at home. Yesterday I was getting her out of her carseat after an outing to Ikea and she was burning up. Surely, I thought, it's because it was too hot in the back seat. I mean, it's August in Houston. The heat index today is supposed to be 109. We put Annabeth down for a nap and I took Jackson swimming. A thunderstorm cut that short and we returned home with ice cream treats from Sonic. I had just gotten out of the shower when Annabeth woke up. She was still burning up. Two thermometers told me she had a 103 degree fever. Bless her heart. There's a new pediatric urgent care clinic nearby, so I threw my wet hair in a bun and we made our way there. Being a parent is so tough. Half of my brain was telling me to get her to the doctor as fast as possible and the other half was saying, "It's just a fever. You're overreacting." I let my cautious side triumph. I wanted to take care of it when the clinic was open rather than end up in the ER if she got even worse in the night. An hour later, I had one of the worst experiences I've ever had as a parent. The doctor couldn't find anything wrong with her ears or throat, so he needed a urine sample to rule out a urinary tract infection. "You need to put a bag on her?" We'd done this once before. I felt so bad when they'd had to remove it from such sensitive skin. The doctor gave me two options - a catheter or the bag, which he emphasized was not as accurate. But it was my choice, he said. He downplayed the catheter, even though I was about to throw up at the thought of it. I did not know what to do. Honestly, I didn't think it would be a UTI and I wanted to just leave! But I said yes to the catheter because it was more accurate. It was horrible. As long as I live, I will never forget letting my baby be put through that. I looked down and saw the iodine, which I thought was blood, and thought I was going to be sick. "Are you okay, Mom?" The doctor came back in with a Cinderella sticker for my little princess. I didn't think she would give two hoots about it, but she seemed to like it. In the end there was no UTI. I left without knowing the cause of the fever, but with a raging case of mommy guilt. The only thing that eased the guilt was thinking of the parents all over the world who are being forced to make much tougher decisions. Their doctors are explaining the choices of cancer treatment or types of brain surgery - none of which are perfect, all of which are painful - and saying "It's up to you." The only plus side about yesterday was all the snuggle time I got with my girl. At 18 months old she is already too busy to sit in my lap or to let me rock her! I will say two things about the last week - it has been busy and it has been fun! Last Friday I went to Galveston for the night with some girlfriends. We drove down in my Jeep Grand Cherokee and I was flooded with memories of driving my high school friends to the beach in my old Mustang convertible. This was much more fun, however, because we got to stay the night at the San Luis without any adult supervision and we had a blast! Heather, Debra/Deb, and Missy have posted great recaps, so I will keep this simple. Our little getaway was such a gift. I just kept saying, "I can't believe we're really doing this! I can't believe it worked out!" The next morning at church, my dad said, "Are the kids coming over tonight?" in such a tone that I knew that indeed, the kids would be coming over tonight. Not that I was ready for them to leave me since I'd been gone for 24 hours, but I knew my parents were dying to have them. Who am I to argue? England has been on our minds, perhaps because a few days from now will mark six years since we returned home from our little stint in Thornaby-on-Tees. It was only a 5 month deal but it marked us forever. One thing Curtis and I often reminisce about is the traditional Sunday dinner. There was an amazing family who always invited us to their home after church for a feast of roasted chicken, roast beef, roasted potatoes, peas, mushy peas (shudder! 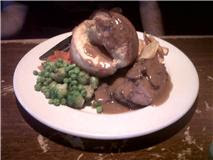 ), carrots, and the all important Yorkshire pudding with gravy poured over it. 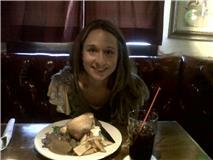 We would practically sell our birthrights to have that meal again. I've known about a British pub here in Houston that serves the Sunday dinner. Pubs are not really our scene, so in all this time we just haven't gotten around to going there. It would be so convenient after church since it's close by, but it's not really a place I would take my kids. All that to say, England was in our thoughts and we had a random Sunday date night, so the Red Lion it was! When we opened the front doors and stepped in, it totally felt like being in England again. There were some British people there and we enjoyed hearing their accents. We are big, dorky Baptists who were clearly there to eat and not to have a pint, so we ordered our Dr. Peppers that came with ice, giving the evening three strikes against authenticity. Oh well. We are who we are. Soon the waitress brought us two huge plates piled high with all the food we have so longed for. (The only thing missing was mushy peas.) Presiding over the plate in all its gravy and goodness was the Yorkshire pudding! Ahhhhh! At long last! I did not want to intensify my feelings of Baptist American dorkiness, so I left my good camera at home. I did have my phone camera, from which I offer you these two very poor images. In no way does this picture adequately convey the sheer and utter glee that filled my heart. Curtis felt it too. We both had lumps in our throats, although Curtis Jones will never admit that. I'll never know if it was for the food or for the grand adventure we were reliving. We left very happy and very full. Our next stop was at the cinema where we watched Inception. Y'all! This movie was so crazy! It made me very claustrophobic and I must admit I had to do some deep breathing to keep myself from running out in a panic. The rest of the week has been a whirlwind. On Monday night I had bunco. On Tuesday night my Ruth Bible study group had our last meeting. And last night some girls from my Sunday school class got together to pray for our families. (It was awesome. You should definitely think of doing that with your friends.) It's been a great week! And I'm worn out! We have our last night of Metro tonight and that will put a cap on our very busy summer schedule. Curt's parents are coming to visit and he is preaching at our church in two weeks, but other than that we just get to chill a bit until September. I'm forcing myself into activity detox for the next week. And, bless his heart, I owe Curtis some free time in a big way.